Instructions: Click here to view more photos of this project. Choose desired patterned papers from the Oakberry Lane Paper collection to cover each page. Die cut to match the card base, using the Fleur Border Basics die. Ink the edges with a desired ink color before adhering onto each panel using Dries Clear glue. Use the circle die to die cut the back panel before adhering it onto card. Die cut another purple panel to layer onto smaller panel. Die cut Happy Birthday using Elegant Border Basics die. 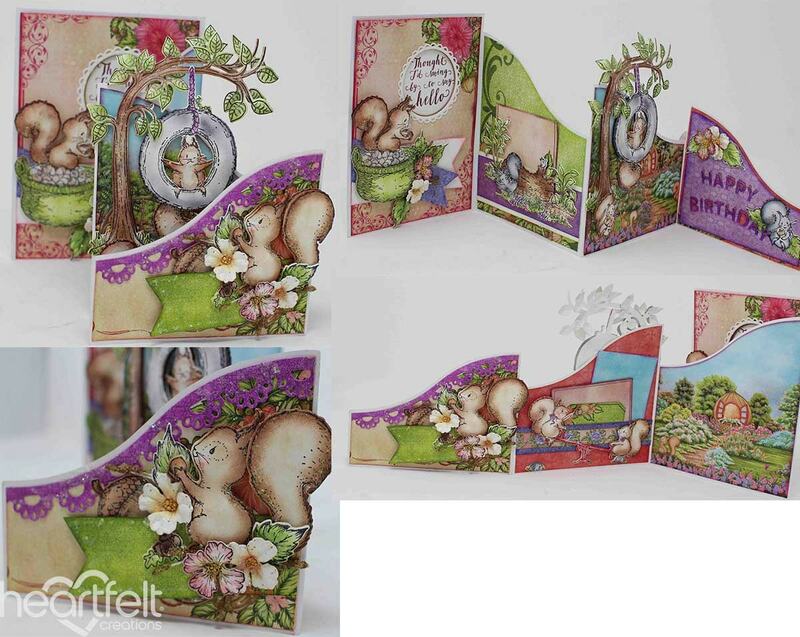 Slide a scrap paper under the curved words, use dauber and Deep purple ink to color "Happy Birthday". Adhere onto panel. Die cut Fleur border onto purple designer paper, trim and adhere onto front card base. Stamp the following images in Jet Black ink: Two squirrels in basket, log, two squirrel in tire swings, running squirrel, acorn, 5 leaves, three small blossoms, two siting squirrels, two large squirrel images, teeter totter squirrels, and two trees. Stamp 4 small blossoms in Frost White ink, emboss with Aged Ivory embossing enamel. Color using daubers and the following Archival inks: Vivid Chartreuse and Leaf Green for basket, and all foliage. Coffee and Sepia for squirrels, acorn, log and tree trunk. Use Jet black to color one sitting squirrel, and one running squirrel, and tire swing. Adding Cactus Flower, Deep Purple and Jet Black as accents on desired images. Vermillion to color the teeter totter. 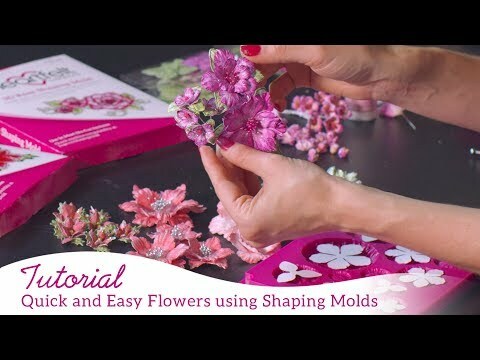 Use Buttercup to color the centers of all the blossoms, adding Plum ink to the embossed flowers and Rose Madder and Tea Rose on the black stamped flowers. Using white cardstock die cut the scalloped oval and circle together, creating a scalloped frame. Adhere the frame onto the opening on the back panel. Stamp the sentiment using Plum ink onto the remaining circle, sponge the edge with Buttercup ink and adhere directly onto card base, inside circle opening. Cut strips of cardstock, and designer paper to embellish, flag cutting the edges of desired strips. If you have more than one of the images, cut and layer them on top of each other, adding foam squares to add dimension. Use the Xacto knife to cut an opening in the log, add squirrel. Adhere all images as shown using Dries Clear Glue. I added gold stamens in the flower clusters for added interest. Add Crystal Clear on background and images. Finally add Prills to the centers of blossoms.